In the February 8th USDA report, US national corn yield was decreased 2.5 bushels per acre from the November estimate. This pegged 2018 corn production at 14.4 billion bushels. The trade had anticipated this big drop from November and the market shrugged it off. On the soybean side of the ledger USDA announced a record production of 4.54 billion bushels based on an average yield of 51.6 bushels per acre. This was proximally 2.3 bushels per acre above last year, but .3 bushels per acre less than a record. It confirms what we knew all of last fall; the United States had some huge crops. The quarterly stocks numbers are always interesting and as of December 1, 2018 the US corn stocks totaled 12 billion bushels, which was slightly below the trade estimate. The US soybean stocks were estimated at 3.74 billion bushels on December 1st, which was 18% above where we were a year ago. However, this was within the trade estimate. The USDA also started to ratchet down Brazilian soybean production coming in at 117 MMT from their previous estimate of 122 MMT. The USDA also lowered total Chinese soybean imports for the 2018/2019 marketing year to 88 MMT from 90 MMT. On February 8th, corn, soybeans and wheat futures were lower than the last Market Trends report. March 2019 corn futures were at $3.74 a bushel. The March 2019 soybean futures were at $9.14 a bushel. The March 2019 Chicago wheat futures closed at $5.17 a bushel. The Minneapolis March 2019 wheat futures closed at $5.68 a bushel with the July 2019 contract closing at $5.22 a bushel. The nearby oil futures as of February 8th closed at $52.72/barrel up from the nearby futures of last month of $53.80/barrel. The average price for ethanol on February 8th in the US was $1.48 a US gallon the same as last month. The Canadian dollar noon rate on February 8th was .7536 US, less than the .7541 US reported here last month. The Bank of Canada’s lending rate remained at 1.75%. In Ontario, the difficult corn harvest, which seemingly never ends continues. However, increasingly there are fewer and fewer cornfields across Ontario. Freezing weather did provide opportunity to harvest, but the VOM situation remains the same. The reality is fields yet to harvest may be some of those fields deeply compromised by VOM. Needless to say, farmers continue to deal with this extraordinary difficult corn-marketing situation. Corn basis levels have actually increased in southwestern Ontario and decreased slightly in Eastern Ontario since last month. In southwestern Ontario producer selling has been slow, partly because of the VOM situation. This has created a scenario where some farmers are waiting on sales and the basis has responded accordingly. It is likely to continue, but basis bids will surely reflect on an individual basis the VOM levels on delivered corn. This will likely continue to be frustrating for those affected. 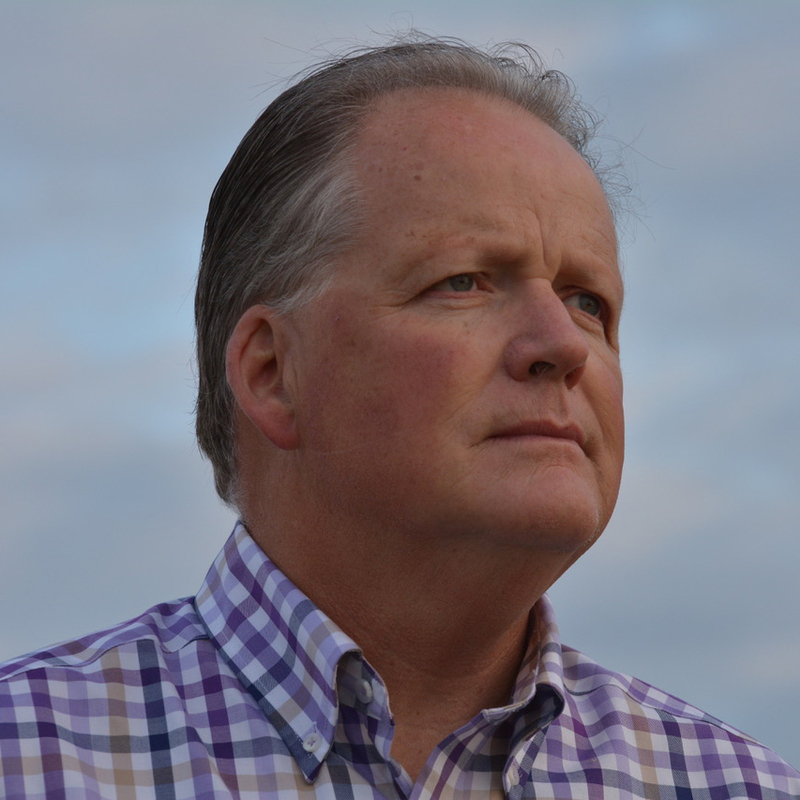 Export opportunities in the spring may help with a solution. Soybean basis bids have remained approximately the same for both old and new crop soybeans from last month. Of course, this is highly dependent on the value of the Canadian dollar, which has been fluttering between the 74 and $.75 level over the past few weeks. Old crop corn basis levels are $0.95 to $1.10 over the March 2018 corn futures on February 8th across the province. The new crop corn basis varied from $0.85 to $1.15 over the December 2019 corn futures. The old crop basis levels for soybeans range from $2.09 cents to $2.15 over the March 2019 futures. New crop soybeans range from $2.25-$2.30 over the November 2019 futures level. The GFO cash wheat prices for delivery to a terminal on February 8th were $6.73 for SWW, $6.79 for HRW, $6.59 for SRW and $6.48 for Red Spring Wheat. On February 8th the US replacement price for corn was $5.55/bushel. 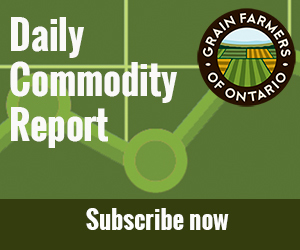 You can access all of these Ontario grain in the marketing section at http://gfo.ca/marketing/daily-commodity-report/. Now that the dust has settled from the United States government shutdown the USDA will continue to update our world agricultural supply and demand numbers on a monthly basis. It is interesting how we completely missed the January flashpoint in markets that the final report usually creates. With the corn production number being down 2.5 bushels per acre, if history has held true, we would of likely seen some explosive price movement in January. However, the market completely shrugged those numbers off reported on February 8th. The time between reports saw the market absorb information more slowly. Now that the reports are up and going again, they should continue to service as flashpoints for price. In a few weeks, the USDA will be holding their Outlook forum where they announce some new acreage projections for the 2019 crop year. Early projections may see corn acres come in at 92 million and soybean acres reduced to 82.5 million. This will be significant for price direction going forward. It is no secret that the Soybean Mountains across the Western Midwest need to be reduced. A large part of that equation will be less American soybean acres in 2019. The soybean market continues to be affected by every inflection of the China United States trade negotiations. These negotiations are set to be completed by March 1st. However, recent indications coming out of the American government has said that this date may be extended. American farmers and the commodities they grow are continually on the head of the spear when it comes to American trade policy. It happened last summer when China responded to tariffs on soybeans after American tariffs were applied on Chinese steel and aluminum. Needless to say, if there are a trade agreement those commodities on the head of the spear should see price appreciation. However, it might not be swift, much more long term in nature. Soybeans are one thing, but corn is another. The Americans dominate that market much more than soybeans and almost everybody on the production side would like to see corn prices break out of there 4 year trading range. Will December 2019 corn breach $4.50 a bushel? With a 1.735 billion bushel carryout we are headed in the right direction. However, with December 2019 corn currently trading $3.99 as of February 8th, it seems a long way away. Seasonality counts for a lot and as we move into spring marketing opportunities close to $4.50 would be opportune. Corn missed some fireworks this year for sure. For instance, the 2.5-bushel per acre reduction in corn yield was the largest change from the November USDA report in history. It is likely if there was a January report, price movement on corn would be explosive, simply because that’s the nature of the beast in January. However, the market shrugged, that information must’ve been massaged over all of those cold days since November. US corn demand is in flux, which we don’t like to hear from the USDA. For instance there was 165 million bushel decrease in the usage for corn from the November USDA report. There was 125 million bushel drop in feed demand, a 40 million bushel drop in food seed and industrial, of which 25 million was reduced ethanol usage. That is likely to be temporary, but it was a bit of surprise, especially that feed number. In fact, the Dec 1st quarterly stocks did show lower than expected corn inventory of 11.952 billion bushels. The March 2019 May 2019 corn futures spread is currently -8 cents per bushel, which is considered sideways. The nearby spot corn contract is currently priced in the 34th percentile of the past five-year price distribution range. Seasonally corn prices tend to trade higher into June. We still have too many soybeans. That lament will probably continue throughout 2019, but there are some cracks in that facade. For instance, we have heard of the hot and dry in Brazil over the last several weeks and USDA reduced its production estimate their 117 MMT, obviously taking baby steps down from the earlier estimate of 122 MMT. Keep in mind; Argentinian production is still pegged to 55 MMT. Our American friends also have fewer soybeans, with their ending stocks now pegged at 910 million bushels. However, this is still a very onerous number. The December 1st soybean stocks were pegged at 3.736 billion bushels, which was a whopping 575 million more bushels than last year. The China, United States trade spat definitely matters. The March 2019 May 2019 soybean futures spread is currently -14.25 cents as of February 8th. This is considered sideways to bearish. The nearby spot contract is currently priced in the 14th percentile of the past five-year price distribution range. Seasonally, soybean futures prices tend to trade higher into July. Wheat seems to be in a never-ending loop of bearishness. USDA actually increased wheat stocks both in the United States and globally. Winter wheat seeding in the United States was 1,000,000 acres below trade guesses and is the lowest number since 1909. At a certain point this should make a difference as Chicago wheat has been strong against KC wheat. However, it is a bit of a long story, bad weather last fall had much to do with the lower wheat planting numbers. In Ontario, some wheat is underneath the snow and some isn’t. In fact, large acreages of wheat, which are planted last fall, never really did show up. It mirrors the American situation in many ways. There were opportunities to hedge Ontario cash wheat sales last summer at $7 a bushel for July 2019. It surely will be challenging for many farmers to satisfy those contracts based on the difficult wheat crop February reality. We’ll hope for better things in April. The continued stimulus to Ontario cash grain prices is the value of the Canadian dollar, which has been fluttering in the 74 and $.75 range over the last month. Ontario farmers are always sensitive to the value of our currency, which continually fluctuates on currency markets. Recently, Bank of Canada governor Stephen Poloz has mentioned the US Federal Reserve responding to a strong American economy by moving interest rates upward. This has had the effect of a lower Canadian dollar, which is supporting our Canadian economy. As per usual, the value the Canadian dollar moves in an inverse fashion to the US dollar, which should serve as a rule of thumb for Ontario farmers dealing with foreign exchange risk. This is in lieu of other foreign exchange risk management strategies which are much more complicated. 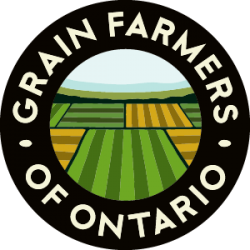 Many Ontario farmers have turned to flat pricing to deal with are constantly fluctuating Ontario cash grain prices. For instance, in Eastern Ontario $200/tonne for corn and $425/tonne for soybeans serve as nice round numbers for many grain price-marketing orders. $5 corn and $12 soybean serve the same purpose in Southwest Ontario. The challenge will always be finding that sweet spot between foreign exchange risk and futures price appreciation. Where would we be if the Canadian dollar were $.85 come harvest time in 2019? Of course, that question could have been asked last year, the year before, etc., etc. Seasonality can always be helpful in pricing grain. For instance, we know that both corn and soybeans futures tend to rally into later spring. For instance, in retrospect last year pricing corn on May 29th was optimal, the year before it was early July and in 2016 it was approximately June 18th. After those dates, markets went down, as traders believe the crop was going to be a big one. As we set pricing orders for 2019, some of this will be the same. The big challenge will be to understand what might be different? However, if things are just like they were last year, that time range for pricing has been rewarding. The challenge to find that marketing sweet spot continues. As we continue through February we will get some USDA projections on acreage. There are also all the geopolitical issues in play, like a hard Brexit, Venezuela and the China US continuing trade negotiations. All of these factors will affect grain prices in one-way or the other. The warming sun into March will do that as well. The road ahead might even include a black swan event, that market factor that swoops in when you least expect it causing extreme volatility. It is a difficult road for sure, but one Ontario farmers have been on continually. It means that risk management never grows old. There will be many marketing opportunities ahead.